The number of people speaking Gaelic in Scotland has fallen below 60,000 for the first time. Results from the 2001 census confirm that the ancient language is still in decline despite continuing efforts to keep it alive. On the surface, the statistics (58,650 Gaelic speakers, a fall of 11% in a decade) might appear to suggest that the language is doomed but its supporters remain upbeat. They point out that Gaelic was deliberately suppressed in the past but that is no longer happening. There has been renewed interest in Gaelic in schools outside traditional heartlands of the Western Isles and the north west. And Scots living overseas have also been taking it up. Last year, a Gaelic Development Agency was set up and the Scottish Parliament is currently spending more than £13m a year promoting the language. Some critics complain that it is money wasted because Gaelic has contracted to the point where it is no longer sustainable. It has been estimated that 1,000 older Gaelic speakers die out every year. Donnie Munro, the former Runrig singer and director of development at Sabhal Mor Ostaig, the Gaelic college on Skye, says that while the census figures may be down the underlying trend is more encouraging. He believes children and new learners are coming through in increasing numbers. And Gaelic speaker Rory MacLean is baffled as to why the language can be so easily dismissed. He said: "To me Gaelic is central to my life, to the environment I live in and the community I live in and my self esteem and self worth is allied to the language. "It is difficult for me to wonder how people can completely ignore it. "As a nation we have to take more on board about our culture in general and the language is part of that, we should make it more integral to our lives." One of those who is learning Gaelic is the Scottish National Party's Michael Russell who brought a Gaelic Language Bill before the Scottish Parliament. Regardless of whether the Bill goes through, it has contributed to the debate about the future of the ancient language. Another new learner is BBC Scotland's Ali Abbasi who has just completed a month-long immersion course in the Western Isles and has even been broadcasting in Gaelic. 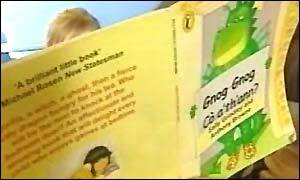 One of the main problems Gaelic faces is a shortage of teachers to cope with those who want to take it up. A dedicated Gaelic school in Glasgow has expanded from 90 pupils to 200 in just four years and there are now more than 60 Gaelic units in other schools. One man who believes it is not time to give up is Wilson McLeod, a lecturer in Celtic Studies at Edinburgh University. He said: "Everyone knows that the Gaelic population is an ageing population and inevitably that population will die. "What is important is how younger generations are coming along. But to pick the figure 60,000 out of the air and say the game is up is meaningless in my view." There is no doubt that Gaelic is fighting for survival but there does seem to be a growing sense of what would be lost if the language were allowed to die.